This was the focus since E3, with statements constantly comparing this game to Skyrim and other open world games. The new gameplay footage focuses on that. Shigeru Miyamoto and Eiji Aonuma mentioned “high places” that allow for long viewing distances to survey the territory. This is brilliant. The Zelda series is all about the thrill of discovery and exploration. Taking the time to climb high cliffs will reward you in this game, not just necessarily with items or treasure, but with a view of the vast world around you. That excellent view isn’t just eye candy, either; it makes for a great opportunity to plan where to go next. The Gamepad plays into this in a big way. You can look in first-person mode and set beacons, or waypoints, which then appear on your map on the Gamepad. I got a decidedly The Legend of Zelda: Wind Waker HD vibe from the Gamepad’s map. It was wonderful having the map always viewable in that game, and it’s clearly going to be a big deal in this game. Exploration seems to be the focus here, with great vantage points, long draw distances, beacons, and a versatile map on the Gamepad. The Sail Cloth, first featured in The Legend of Zelda: Skyward Sword, makes a return in a delightful shot of Link leaping from a tall cliff and then gliding over a forest. You’ll notice a distinction from Skyward Sword — Link’s descent can be controlled here. In fact, the Sail Cloth acts more like Wind Waker‘s Deku Leaf than Skyward Sword’s Sail Cloth. I have a feeling this will be involved in more than just fun ways to quickly travel from a high point to a low point. Perhaps, like the Deku Leaf, it will have a role in dungeons? Epona is back! Given the giant world to explore, it’s imperative that you have a faster way of traversing it, and galloping on horseback is as Zelda as it gets. An emphasis in the footage was placed on the horse AI — Epona won’t run into trees or other obstacles, and Aonuma even demonstrated that Epona can move without you touching the control stick. How will this work? I am guessing you can either set a destination on the map, and Epona will automatically travel towards it, or you’ll get Epona started manually and then she’ll travel forward at whatever speed you set, with you able to choose when and where to steer and stop. Mr. Aonuma also used the A button to speed up Epona, much like in every game she has appeared in. 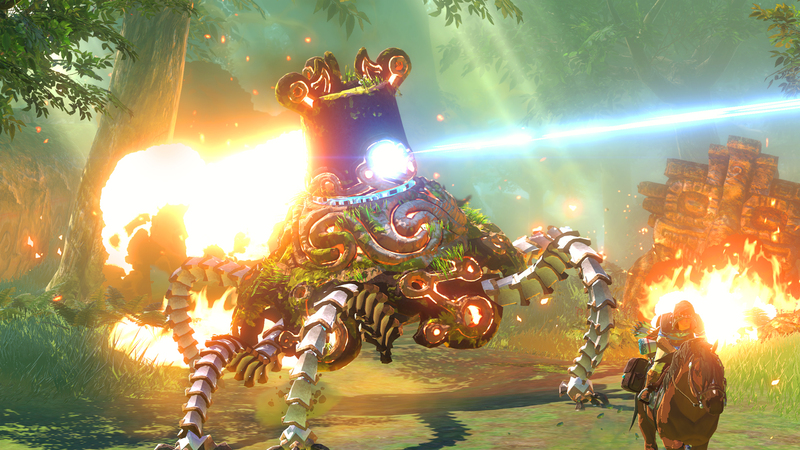 This allows for quite possibly the best on-horse gameplay we have ever seen in a Zelda game. With Epona’s new path, you can now rotate the camera freely, swing your sword at enemies, hold up your shield to block attacks, and even fire your bow with more freedom than even in The Legend of Zelda: Twilight Princess. With such a giant world to explore, and Epona being key to traversing it, having mounted combat work flawlessly is likely going to be a big part of how this game plays. I think we can expect to see many enemies meant to be fought on horseback. Think about that giant walking Beamos creature from the E3 trailer. We’ll likely also get many mounted enemies à la Twilight Princess, other giant monsters like in the E3 reveal, as well as on-foot enemies that can be picked off easily or dispatched on foot. Mr. Aonuma has talked about how they want to rethink how you approach combat, and this world, coupled with the emphasis on horseback combat, seems to be moving towards just that. Assuming the AI for Epona works as well as it seemed to in the gameplay footage we saw yesterday, this could be a truly exciting experience. This was made clear with Mr. Aonuma moving the Gamepad to look around the surroundings and plant a beacon at the start of the footage, as well as to aim his bow during combat. Gyroscopic aiming first appeared in a Zelda game with The Legend of Zelda: Wind Waker HD and The Legend of Zelda: Ocarina of Time 3D, and since then it has been my favorite way of using the bow and arrow. I’m excited to see it return, and the fact that it plays a part in both first-person and third-person sections is interesting. The use of gyroscopic aiming in third-person, as well as being able to rotate the camera with the right analog stick, could allow for some really fast and frenetic archery sections while on horseback. I hope they put these features to their full use in challenging sections in the final game. Having the map on the Gamepad presents an interesting hint – we will likely be seeing Gamepad integration much the same way as we did in Wind Waker HD. The map will be fully visible on the Gamepad’s screen, with buttons to zoom in and out (and out, and out some more). We can place beacons on the map – perhaps we can even use the stylus to write notes and attach them to landmarks? It is also reasonable to expect an inventory management screen on the Gamepad itself, for quick and easy switching of weapons on the fly. That last point can be tied back to the E3 reveal. Link used two different types of arrows there – bomb arrows, and a fancy technological arrow. In yesterday’s gameplay footage, Link used standard arrows. Could the Gamepad be used to quickly switch between arrows during combat? The Legend of Zelda: The Wind Waker allowed quick alternating arrow types with a shoulder button, but if we have more than three different types of arrows and combat situations that necessitate using different types in a single battle, the Gamepad could allow for even faster transition between types for tactical decision-making on the fly. In the UI shown off in the Zelda U gameplay footage, the top left corner is very simple. You have Link’s hearts, and what appears to be a magic meter. This, to me, suggests one of three things. 1 – Magic makes a return! Perhaps we’ll have spells like in Zelda II: The Adventure of Link, or we’ll have medallions like in The Legend of Zelda: A Link to the Past… or even a bit of both. With what we’ve seen of archery’s role, you could probably bet on fire, ice, light, and perhaps new types of magic arrows never seen before. 2 – Skyward Sword’s Stamina system returns! They could be using a constant meter for it in the top left, as opposed to how it was handled in Skyward Sword with just a circular meter that only appeared when using stamina. It could still drain and refresh in quite the same way, but have a more present state in the UI. Maybe because it has more uses than in Skyward Sword? Perhaps Link’s acrobatic skills make use of it. Now, in the footage we saw, I took a close look at Link’s slow-mo acrobatic archery moments, and the green meter does not drain at all, so that is unlikely. However, they could have it set not to deplete during the gameplay demo, to wait and reveal its function at a later time. 3 – The Legend of Zelda: A Link Between Worlds‘ Stamina System returns! The footage shows that we will have arrows, so not every single item will use that stamina system. However, it could still be used for magical items, or special items like the Hookshot and Boomerang. Personally, I believe its resemblance to the magic meters in Ocarina of Time and The Legend of Zelda: Majora’s Mask makes it most likely that the green meter in the UI of Zelda U means the return of magic. But what form might this take? Maybe just magic arrows. Maybe special items like the Goddess Items from OoT – Din’s Fire, Farore’s Wind, and Nayru’s Love. Maybe medallions, special spells like in The Adventure of Link, the possibilities really are endless. What would you like to see? People were in a tizzy over the E3 reveal, mainly over two points. One, Mr. Aonuma stated that the footage was gameplay. Two, we saw Link do a fancy bit of slow-motion leaping from Epona for midair archery. How could these two coexist? Well, simple: it’s a function in the game itself! We saw Mr. Aonuma perform this midair acrobatic archery in slow-motion twice in the gameplay footage. And contrary to what the E3 footage had some people believing – that it was part of a cutscene or quick-time event – you have complete freedom over when to perform this maneuver, as well as your aiming while in midair. What other possibilities could arise from this new gameplay mechanic? Could there be opportunities for these slow-mo sequences on the ground, maybe in sword combat? Will any other items be integrated with this – the Hookshot, bombs, or boomerang, or perhaps brand new items? The other very intriguing part about this sequence, as well as all of the gameplay footage we have seen so far of Zelda U, is the emphasis on Link’s bow. Archery appears to be a key component to this game. Will Link’s main weapon perhaps be his bow? Could the Master Sword be replaced with a “Master Bow” of sorts? Or will swordplay be just as important? It really raises some exciting questions about the gameplay. We have seen, with both Wind Waker and Twilight Princess, different gameplay mechanics add to the ways you can use your sword in combat, with a parry mechanic and secret moves. This is the first time we’ve seen it done for archery. Also on the note of archery, notice that Link’s quiver of arrows (oh so coolly slung behind his waist) is always present, like Link’s sword and shield. This hints at archery playing a bigger role than past Zelda games, which is a pretty exciting idea, if you ask me. Well, that’s all I picked out! We got a brief mention of dungeons, but that was brushed off in favor of focusing on the giant world to explore. There have been some complaints about how empty it is, but this game isn’t likely to release until November/December next year, so they have plenty of time to fill in the space with enemies and townspeople. Also, bear in mind that, when Mr. Aonuma zoomed the map out, we realize that what we saw yesterday was a tiny glimpse of the entire world. Don’t jump to conclusions about the entire game’s world from this snippet! Now it’s your turn. What kinds of gameplay elements did you spot that I missed? What are you most excited about for the gameplay of Zelda U? What are you nervous about? Leave your comments below!